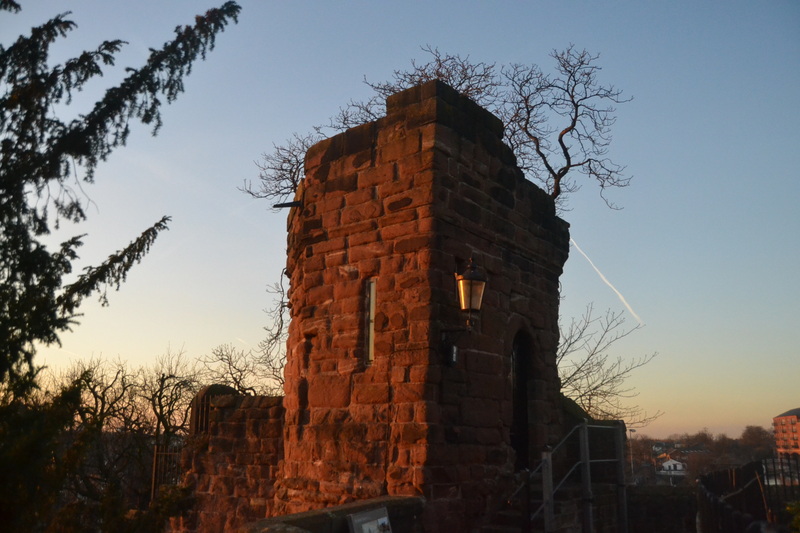 Walking the city walls, arguably our greatest asset, is one of the joys of Chester life. 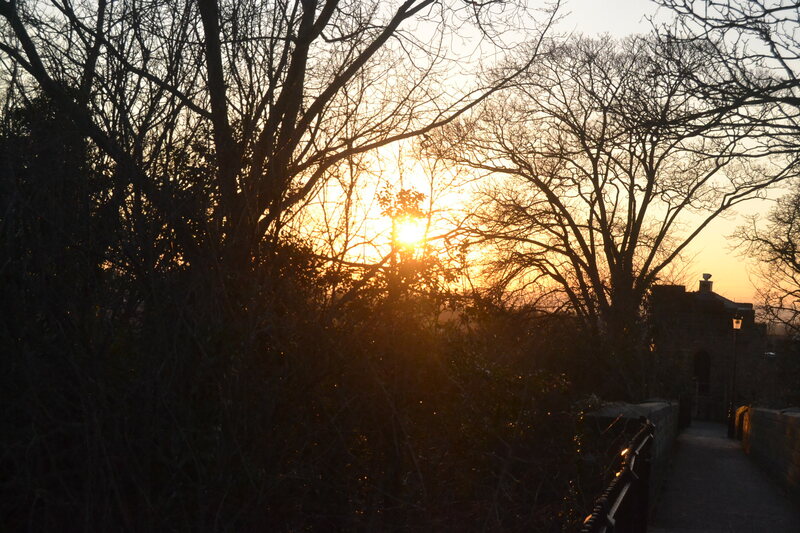 Whether its watching the sunset melting behind the trees near the water tower, freeloading a view over the races in action or the November fireworks, or watching a parade from the Eastgate clock. 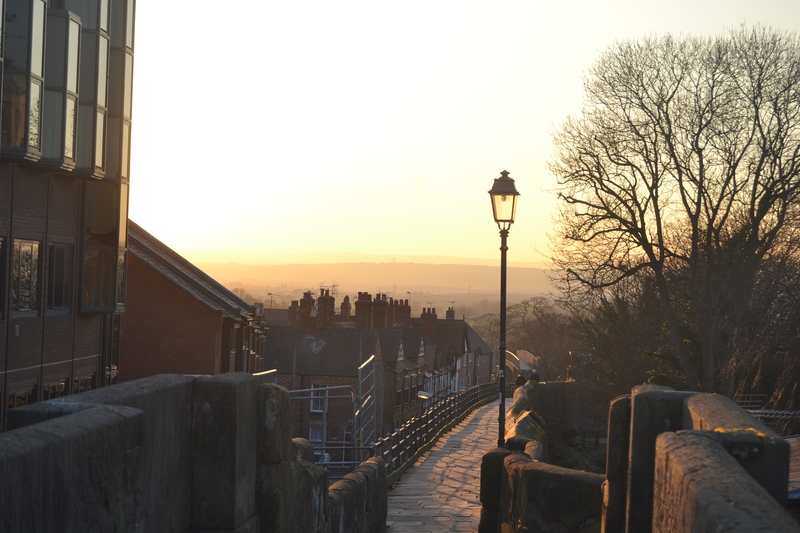 You can enjoy great views across the river and see the best of what Chester has to offer and makes it a unique place to visit . Of course one of the problems of living in a city with so many historic buildings and ancient monuments is the huge cost of upkeep. The section of the walls that collapsed at the side of the Grosvenor Hotel in 2008 took TWO YEARS, to be repaired due to the complex archaelogical investigation required. Currently the wall at the Northgate has been propped up by unsightly scaffolding since 2012, the Eastgate area is undergoing a much needed repair, and the watergate is also bolstered by scaffold. Cllr Mike Jones has quoted 0.5 million pounds a year for walls upkeep, for at least the next 15 years and blames the long delays on timescales set in partnership with English Heritage and the need for sophisticated and long winded wall scientific building techniques. The frustration felt by Cestrians is not helped by the lack of information and the vague timescales. Whilst walking the walls offers the best of Chester taking in nearly all the important sites from the Cathedral to the river and views of the Welsh hills, the boarded up areas and scaffolding are a metaphor for the harsh reality of life and dreams. One follower pondered last week if watercolour paintings of a dsystopian future would depict the walls covered in the now so familiar scaffold., diversion signs etc .. Some areas identified are not scheduled for repair until the space year 2017 (at least)…The council provides information boards which are occasionally updated but the lack of progress is frustraing to Cestrians and must be disappointing for visitors. However its not all bad news from 2009 – 2012 the EU funded Portico project completed a number of improvements to the walls at sites including Morgan’s mount (site of a Royalist civil war cannon), the Newgate, and also allowed for the Water Tower and King Charles tower to be made safe again for visitors after years of dereliction. Vivienne Derricut of Chester Civil war tours explains “ Unfortunately that’s where the funds ended and sadly although the towers were now safe there was nothing left in the budget to pay guides to staff the towers,and the doors once again closed. That’s when Friends of Chester Walls was born. Out of necessity and a real passion to show off these jewels in Chester’s crown the friends took on the responsibility to open the towers” Last summer the volunteers staffed the towers in August and September and welcomed over 8000 visitors. The medieval water tower , built to defend the port of Chester , before the river Dee silted up forming the Roodee (now the racecourse). 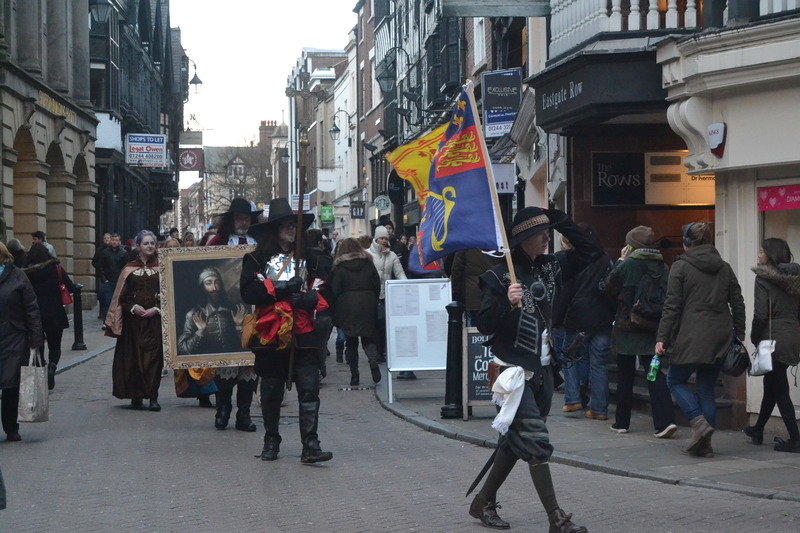 The Friends also staged a number of historical parades featuring costumed re-enactors from all the key eras of the city’s past from Roman times to the Civil War. August also saw the visit of the sealed knot society with Cavaliers and Roundheads marching through the city and then battling on the Dean’s Field. 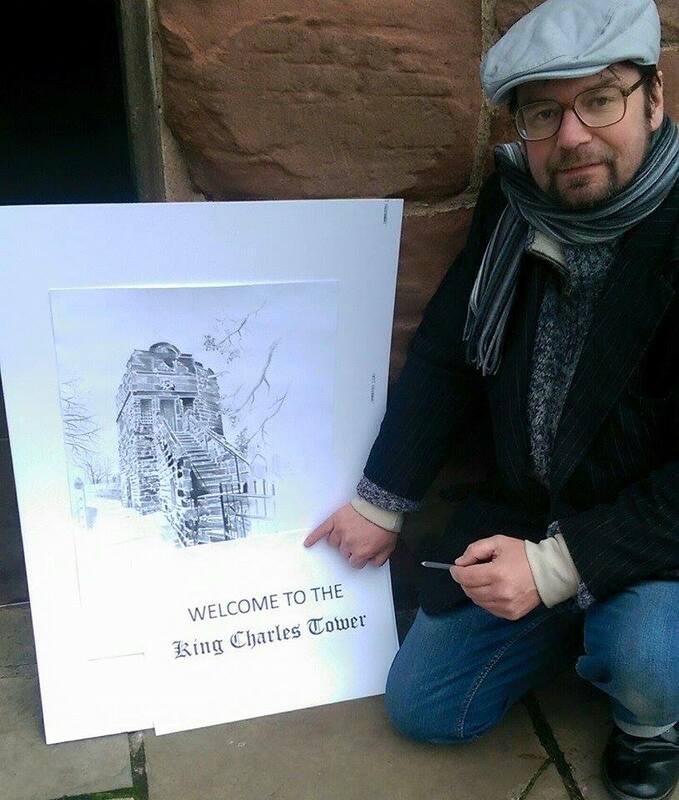 The Friends are affiliated with Civil War Tours who as well as running tours of the walls to explain the troubled history of war era Chester (1642-46) have staged other events including a commemoration of the Battle of Rowton Moor on the battlefield itself. There is nothing of note covering the civil war in the Grosvenor museum and it is a crucial period of history often overlooked by the city’s Roman obsession. “I’ve been here for two weeks… manning the tower , its been an interesting time “theres been quite a lot of footfall, certainly at the weekends..so the walls are still open, which is a good thing because the area by the clock is going to be boarded up.. for, we dont know how long. There are other areas being repaired… The Northgate, the watergate, down by the towpath.. having said that, repairs have to be done… the work needs doing and its just one of those things”. I hope we get as many visitors as we get on a normal year, I’m looking forward to the summer… “this is my workshop, gallery, I’m going to devote half of it to my artwork and half to the actual history of the tower. When people step inside here, theyre stepping into history, which is a unique experience” Chester archaelogical society will also be using the upper floor of the tower to catalogue their finds. The walls are the absolute best of Chester and while there is much work to do to preserve them for future generations, hopefully all parties and voluntary groups and in fact all of the people can come together to benefit the city. The walls date back over 2000 years and whilst the repair work is unsightly, essential repair work must be carried out, is 4 years in 2000 a bad thing? Our leaders need to provide more information and transparency about the length of time for repairs in order to manage people’s expectations… In spite of all this, nothing can take away the view towards the Groves or a twilight in the rain as we imagine the darkness of the desperate siege of Chester. Long live Chester walls. .